Main Engine 2 x Yanmar Z280A-EN, totally 4000BHP at 720 rpm, CPP in 360 degree azimuthing Kawasaki Rexpeller KST-200ZC/A Z-drive units. Repellers operated independently, or combined via joystick control. Main Tow Winch Kitagawa Kogyo electro-hydraulic driven winch Single drum 50/15T x 5/15 m/min brake capacity 100T Wire capacity 1000m x 48mm diameter wire. Automatic spooling gear fitted. Operated at winch side and remote at wheelhouse aft console. Warping drum fitted. Tugger Winch Kitagawa Kogyo electro-hydraulic driven winch 10/5T at 15/30 m/min. Wire capacity 200m x 22mm diameter wire. Fire Fighting Capacity: 2400 cu.meter/hr. Two centrifugal pumps driven through air clutches by the main engines. Monitors: 2 x remote or locally controlled water fire monitors each rated 20, 000 l/minute. 1 x remote or locally controlled foam fire monitor on mast tope rated 10,000 l/minute. Rescue Dunlop rigid hull inflatable boat with outboard engine. Inmersion suits and automatic inflatable life jackets provide. 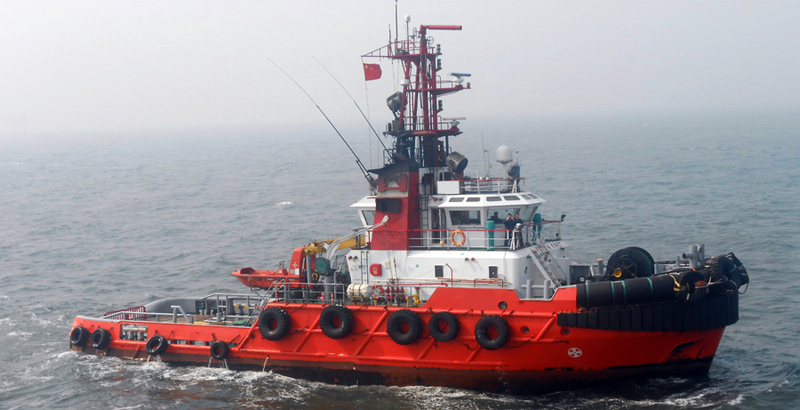 Heavy duty fendering of both horizontal and vertical type, with water lubrication on bow for role as berthing tug.